Jacob watching a strike go by. The pitcher throwing in this picture was very good and had VERY fast pitches. A fine finish to a great baseball season. 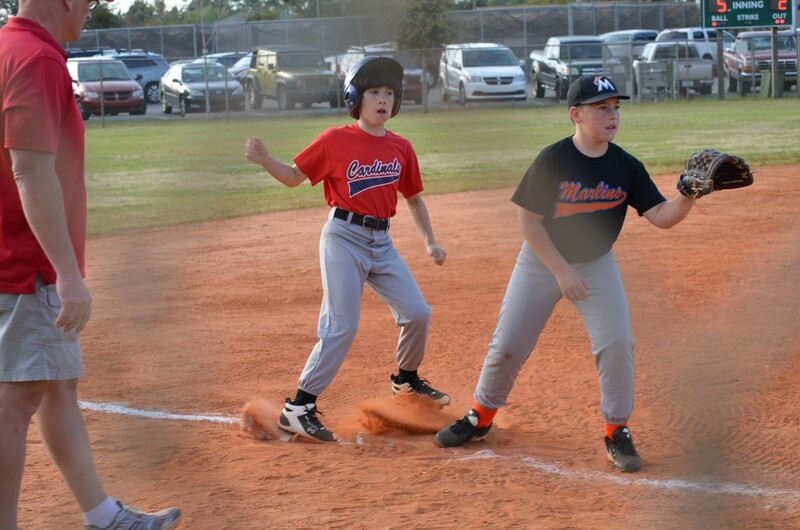 Our youngest son’s baseball team celebrated with the Pensacola Blue Wahoos. 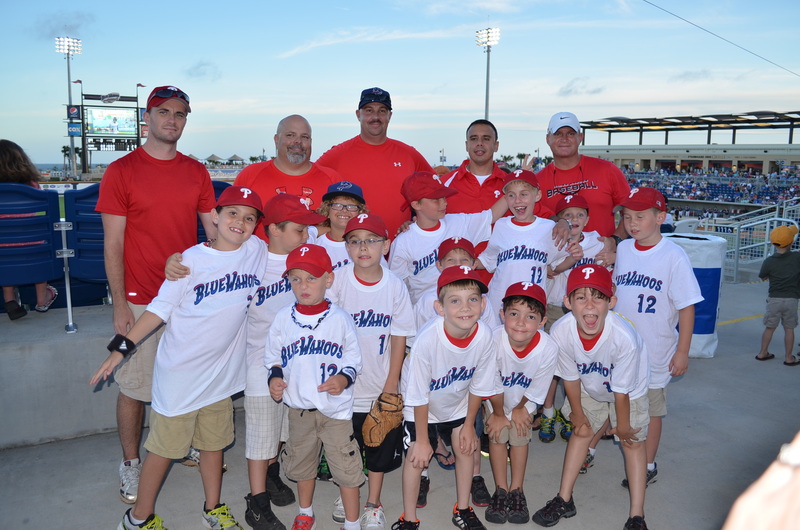 Just before the boys left Florida for good, T’s baseball team enjoyed an evening with the Pensacola Blue Wahoos. I had written about the Blue Wahoos games in a previous post in 2012. The kids got to take part in the team’s “Field of Dreams” experience, which was a block of seats together, dinner, getting introduced as a “featured guest” at the game, and a chance to hang out with the Blue Wahoos players before the game, either by singing the national anthem with them, or else running out to the field with the players as the players’ names are called. 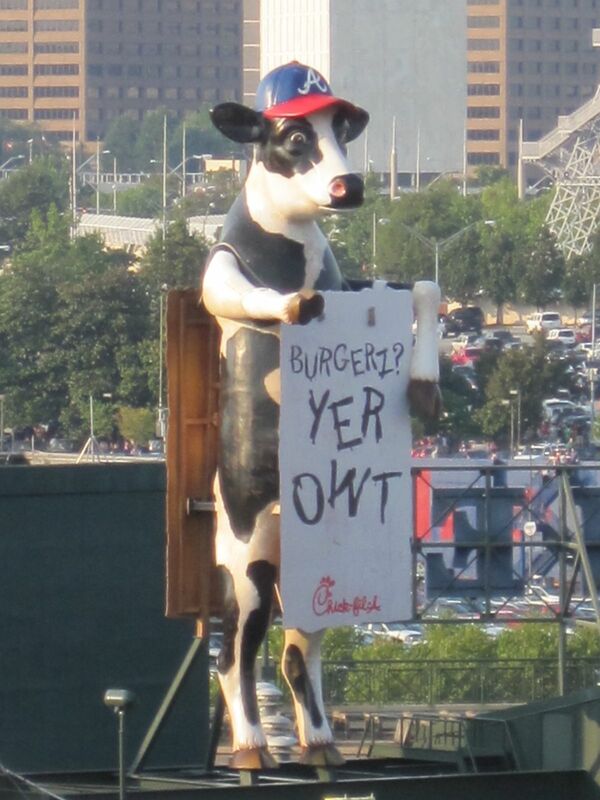 Timmy is on the Phillies. 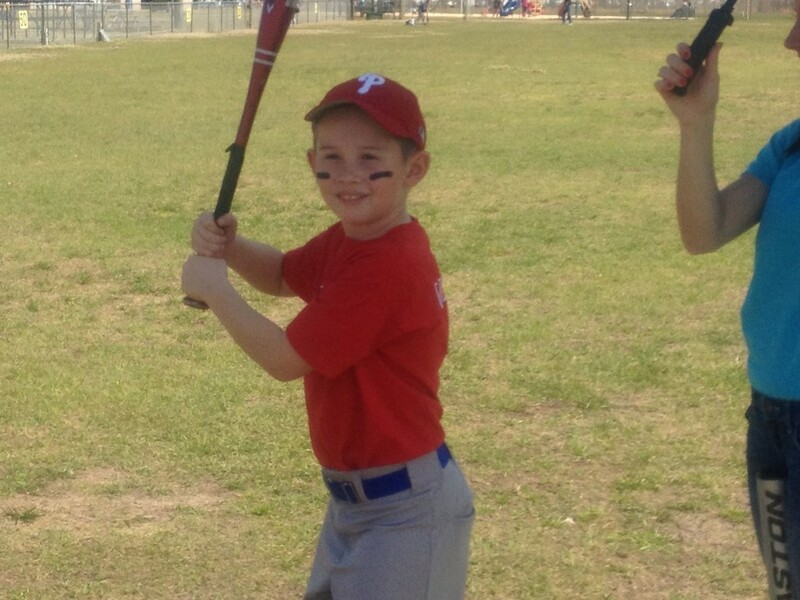 Jacob is on the Cardinals. This year the boys are both on very good, very hard working teams. It’s nice to see their hard work and tons of practice pay off in good records. Since it’s become apparent that the boys are serious about their baseball, we made the investment in some better-than-beginner equipment for the two of them. It’s baseball season here — the boys are both in Navarre Youth baseball this year, and they got their uniforms and had their first games this past weekend. At practice, Timmy is got some time as a catcher. Earlier this month the boys enjoyed a week-long Challenger British Soccer camp put on at the Navarre Youth Soccer complex up the street. My sister’s oldest son had attended in North Carolina in the past and really enjoyed it. The week was VERY hot, and the first day was pretty hard on the boys. But by the 2nd day they were really enjoying the skills-building, mock World Cup, and new friends. 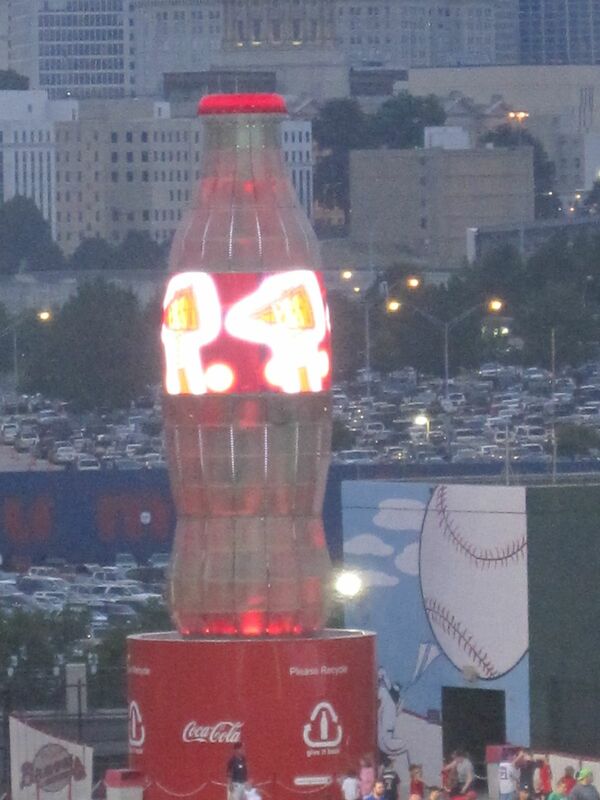 I wonder if adding some Gatorade to their drink coolers helped things out for them. Enjoy some pictures I took on the last day. Jacob’s team won the mock World Cup — they’re lifting the pretend trophy into the air. A nice group shot of the whole camp — this is only about 2/3 of the kids who started. I’m guessing a lot of kids had a tough time with the heat. You can say I tried. 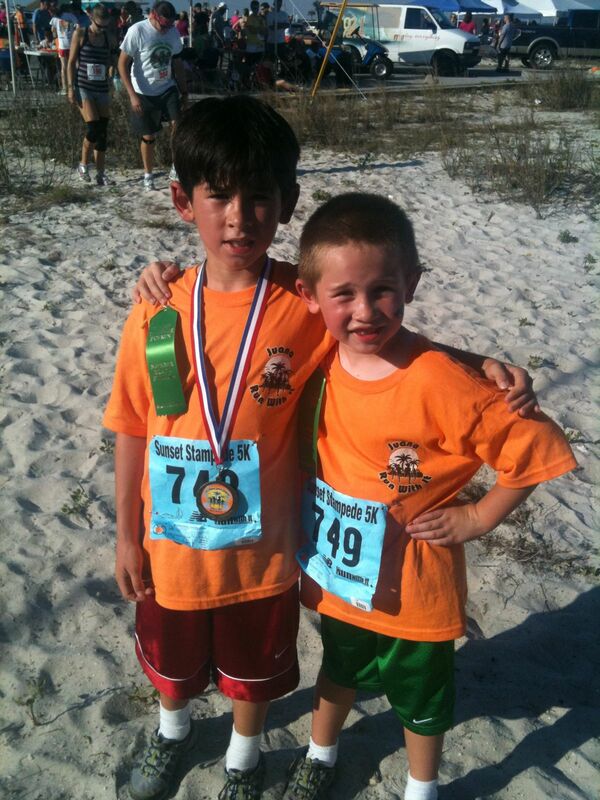 I think Jacob might have a future in long distance running…Timmy probably won’t. 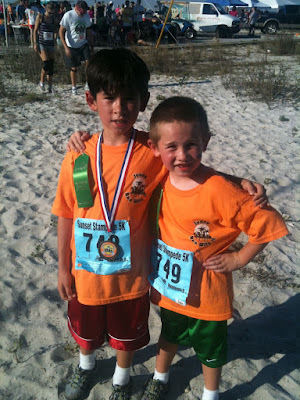 At a Mother’s Day function this past week, one of Timmy’s classmates’ Moms tipped me off to a 1-mile kids’ fun run in Navarre Beach last Saturday. 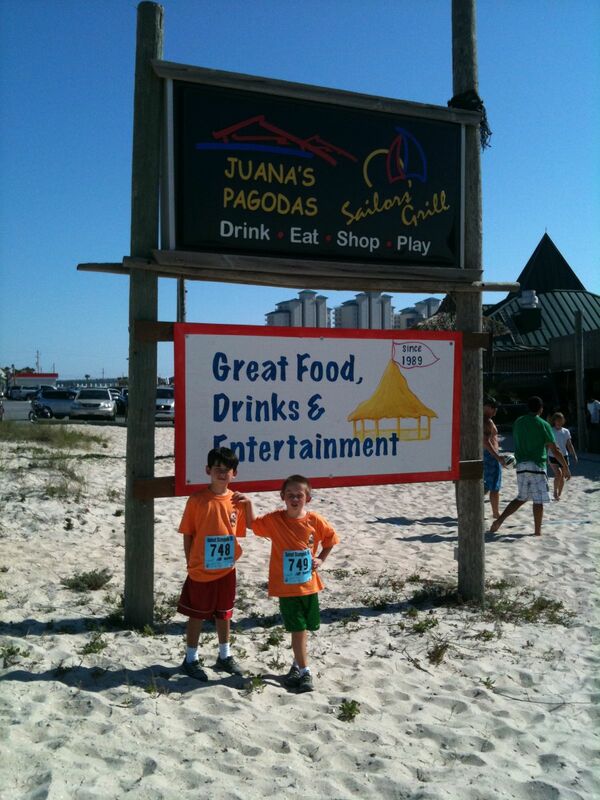 That night I headed over to one of our local hangouts in Navarre Beach, Juana’s Pagoda, for the registration. The owner of Run With It, a local running store, was taking the registrations and I was flattered that he remembered me from when I visited his store a couple months ago. It was very cute how the kids received t-shirts and runners numbers. The boys and I stayed for dinner Friday night and enjoyed the volleyball area and beach area. The run was very hot. 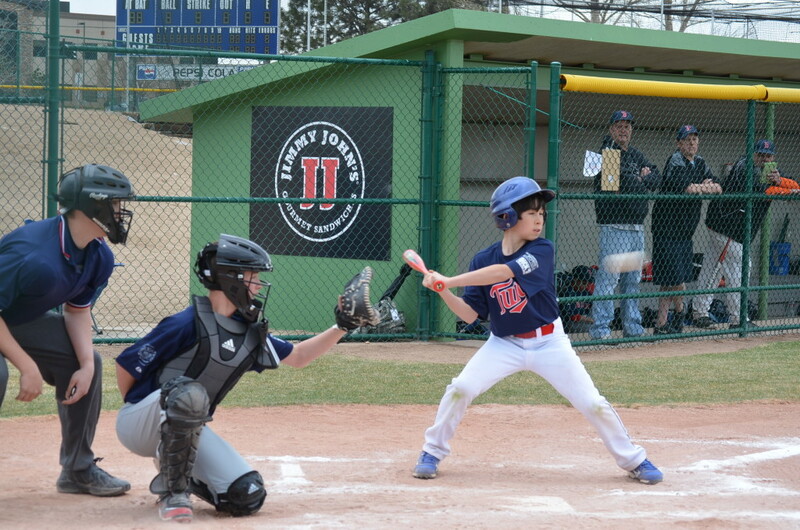 Jacob charged ahead and ran it with all his energy and did quite well. I had to give Jacob some instructions about what to do if he needed help during the run (“tell an adult helper that your Mom is wearing a green t-shirt“). On the other hand, Timmy wanted to hold my hand the whole time and ended up pretty frustrated. Timmy clearly doesn’t like running the way Jacob does! 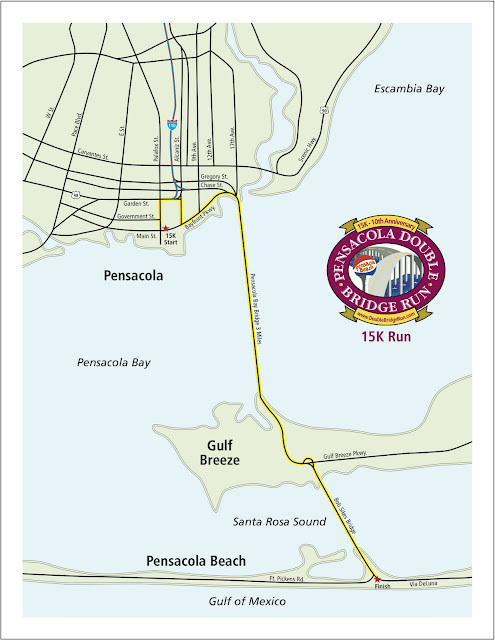 My Double Bridge Run success back in February inspired me to sign up for this half-marathon. I forced myself to do a deliberate training program. Starting right after the early February Double Bridge Run, I ran 2-3 x “short runs” of 3-5 miles each per week, plus 1 x “long run” approximately every week. Sometimes our family’s schedules make things a bit crazy, so that long run was about every 8-10 days instead of once a week, but it worked out well. My longest “long” training run was just under 13 miles and after dealing with that one, in mid-70s sunshine on the beach, I felt I was ready! We were doing some Cub Scout camping in the town of Defuniak Springs, about 70 miles northeast of here, this past weekend. I left Dave and the kids at the campsite Saturday night, drove home and got a very good night’s sleep beforehand. As is the case in most Florida warm-season races, the start time was 7am so I had to leave the house before 6am for the 30 minute drive to Pensacola Beach. The sun was just rising as I was coming across the Pensacola Beach causeway, and you can see the low stratus clouds pouring onshore from the gulf. This is what it was like for the whole run! 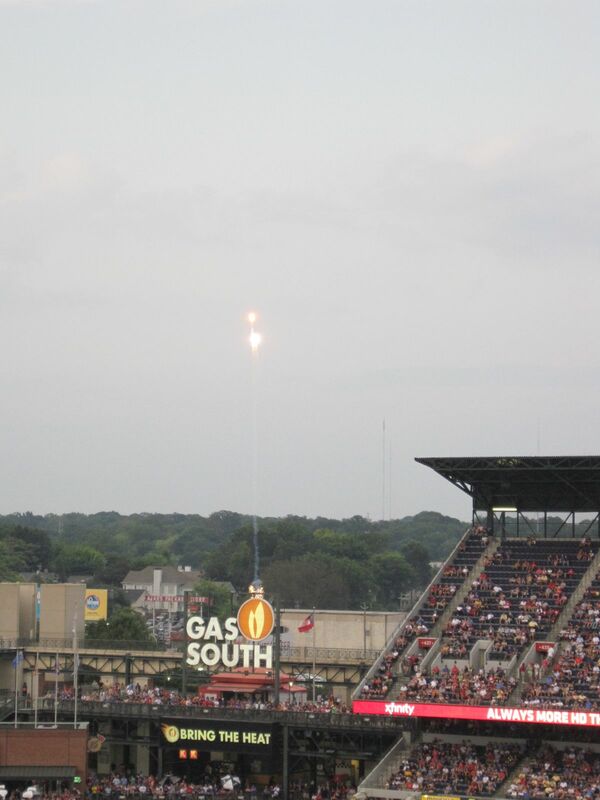 The clouds were great, but the 100% humidity still made it uncomfortable. 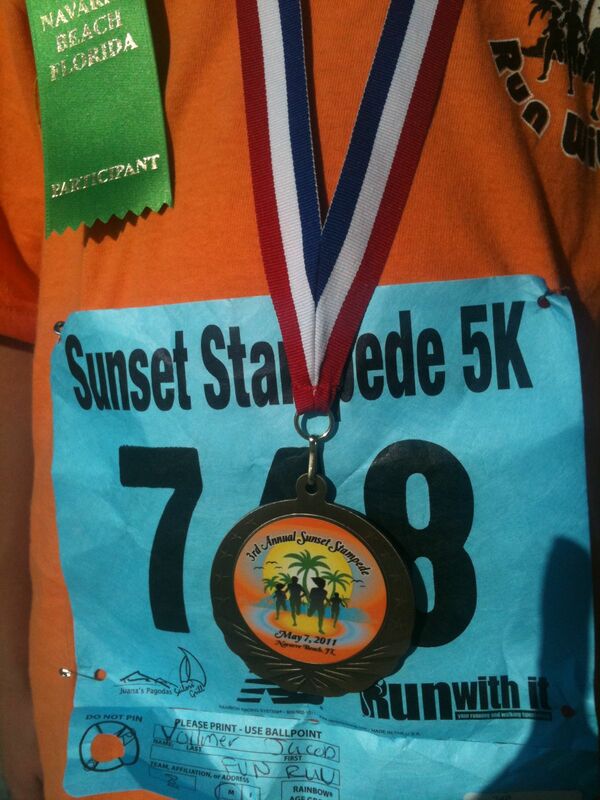 I want to show off this runner’s bib. I didn’t really pay much mind to the part of the registration about what I wanted my bib to say for a name. I never had a custom bib before. I wish I had put “Major Mom”. I asked a random guy to take this picture of me about 15 minutes before start time. I’m all geared up here — bandana tucked into my waistband, headphones at the ready, Nike+ sensor on my shoe, and an 800 mg Motrin pill & Clif Gel in my back pocket (the Motrin sorta dissolved in my pocket during the run, UGH!). What’s funny about these kinds of races is that I spend so much time weaving my way through people who run rather slowly, yet are at the front of the pack when the gun goes off. It took about 3 miles before I didn’t have to worry about passing people. And then I had to go to the bathroom — rrrr! With the incredible humidity I had chugged a LOT of water just before the start, and it was catching up with me. So I took a 2 minute potty break at the 3-mile point. There was a race photographer right by that porta-john so I’ll have to see if there are pics of me waiting, ha ha! We were running on roads that were alongside the beaches. There were so many dead crabs on the roads…and people were just crunching away at those crabs! Even though the roads were closed for the race, there were still cars on our route, driving just as fast as we were running. That exhaust didn’t help one bit! I got to see the race leader pass me when I was at about 5 1/2 miles heading east. The westbound route in the opposite direction was just past the 9 mile point. 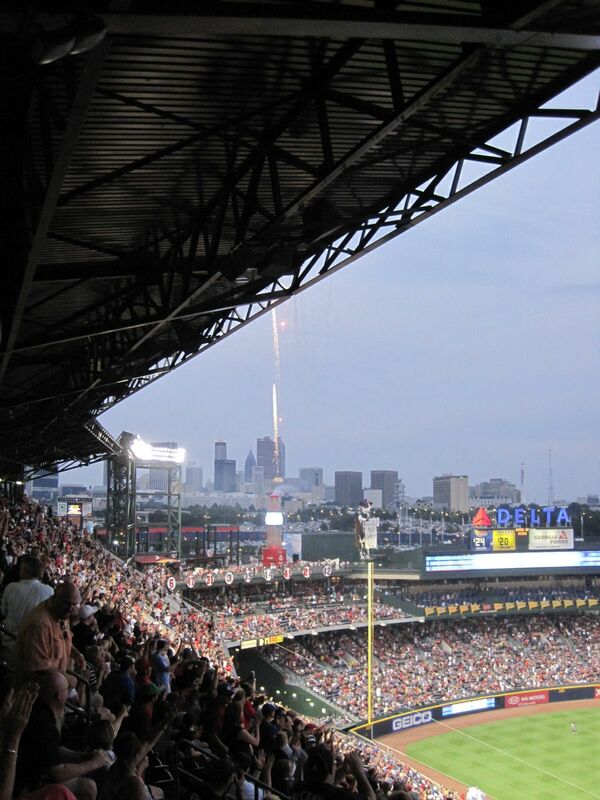 Whoa…. 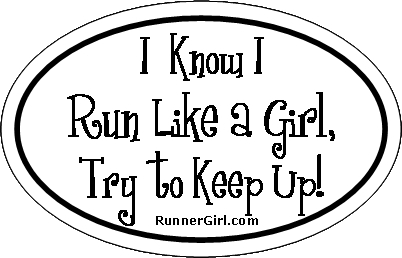 Even though the course was flat flat flat (yay! ), the cant in the road on the curves was tough on my ankles. At the end of the Air Force marathon there’s a loopy type of thing at the end…you’re coming a little down a hill and the finish is right in your face, but then you turn AWAY from the finish line and do another 1/2 mile or so weaving through the Air Force Museum outdoor displays before you get to the finish. In this race, the weaving and looping around is done in other parts of the course, so when you are heading in the last mile towards the finish, it’s a straight shot! Thanks for that! I had set a goal for a 2 hour race, but I don’t know what I was thinking. In my training runs I never ran that fast, and perhaps a more realistic goal would have been 130 minutes. I finished in 127 minutes and I’m thrilled at that! 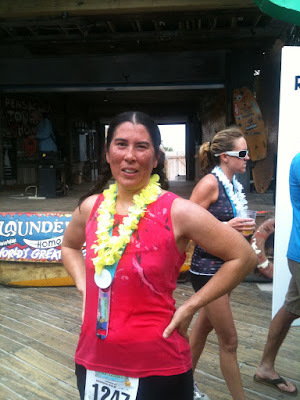 This is my soaked-in-sweat picture about 10 minutes after finishing. That humidity took a toll! My info is just above the halfway point of this list. These are the preliminary results, before all the runners had some in (or not come in, in the case of some of them). Once the results were official, I somehow went from placing 440 to 380. Official results are here. The finisher’s medal…and my inspiration for this race — we needed a good strong bottle opener! What’s next? I don’t know. There’s a Pensacola Fiesta 10K on the 30th that I’m interested in, but I think the kids’ sports might impact that. We’ll see. Folks say it’s a very beautiful point-to-point course that ends in the historic Seville Square part of the city. That’s actually a hilly race (yes, hills in Florida!) and it’d be a good challenge. Other than that, there are no more long-distance races in the area until the fall. The Return of Runner Girl? 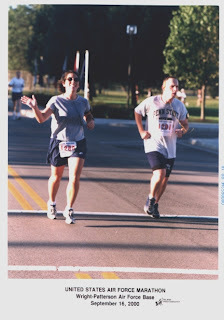 Especially before we had kids, Dave and I enjoyed long-distance running. Obviously, our training dwindled some after the kids arrived, and between Dave and me and our double-jogging stroller, we’d always managed 1-2 races per year even after the kids were born. Then we hit a lazy streak in Nebraska, Dave’s job was really busy, the weather was a pain-in-the-rear (I hate running in the wind! ), and Dave had several medical issues that all combined to keep us from do any more working out than necessary. After a couple years of lollygagging, I took the plunge and signed up for my first running race since June 2009. Which race? No, of course I don’t go easy and sign up for a 5K. Here is the race I registered for. I think I tend to gravitate towards the more scenic races. Check out the course map! Isn’t it beautiful??? I’m excited to get to see sunrise over those bridges! So part of my motivation for this is to to get fit again. Not sure if it was stress, laziness, just plain overeating or what, I’m currently about 15-20 lbs. heavier than when I came home from my deployment in April 2009. I need a goal, and a plan to reach that goal. Hence signing up for a 15K race right off the bat. This spring I’d like to do a 1/2 marathon, I’ll wait to sign up until we see whether I can do this 15K okay. First off, I was in desperate need of new running shoes. I was in the same old Brooks shoes I’d had since Spring 2009. Spare me the lectures, I know one should be replace them every 500 miles or so. So with one of the gift cards I’d received for Christmas (thanks Mom and Dad Vollmer! ), I got a nice pair of trail running shoes. I prefer trail running shoes for the broader, thicker soles. I started my “training” in earnest this week, which meant increasing how many miles I run each week. Normally I do three 5K runs per week, but now I need to do at least 4 runs per week, and at least 15 miles total per week, slowly increasing that up to about 20 miles per week. I’d like to do 5 runs per week but real life might make that a less-realistic goal. Included in that is one “long run”, which needs to increase by 1 to 1.5 miles per week, hopefully I can do that on Fridays. Our neighborhood is expansive enough I can plan lots of great routes or any length I need! 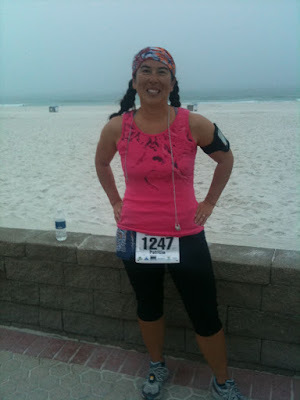 This past week I did a 5 mile run across the Navarre Beach Bridge, so I could get ready for the bridges in the race. Check out these magnificent views during my run! There was a hill on my most-common running route in Nebraska. Westbound Schneekloth Rd. between Spring Blvd. and 34th St. (past the back of the school). I called it “Heartbreak Hill” since the elevation gain is similar to the “Heartbreak Hill” in the Boston Marathon. This bridge here is only 55 feet elevation (not the 85 feet in NE). I’ll take this hill (and the view) over the one I had in Nebraska, ha ha! Unfortunately, after that 5 mile run last Thursday (which felt great at the time), my knees were REALLY REALLY sore for 2 days. I could barely walk on Friday! Not sure if it’s old age or the extra weight I’m carrying around, but I hope this isn’t a permanent issue or else long distance runs won’t last very long in my future. Also, I’ve noticed over the years that my legs, knees and hips are now more sensitive to the cant of the road. My neighborhood doesn’t have sidewalks, so I’m on the far left or right edges of the road surfaces, and if there’s a slope for too long, I feel it in the arches of my feet and in my hips. Here’s hoping I stick to this fitness plan.